Total annual losses were 42.1 percent for April 2014 through April 2015. The new figure is up from 34.2 percent for 2013-2014. You don't have to be a math whiz to know that those percentages spell trouble. So far as I know, there's no consensus on whether the problem is due to one or more causes – mites, pesticides, Rudolf Steiner's prediction of a weakened bee genome due to artificial queening, limited varieties of pollen for commercial hives – they just can't say for sure. So what can you do to help the bees? You can create a bee friendly yard and garden; support responsible apiaries by buying honey, beeswax and other bee products from trusted sources; and join an Adopt a Hive program. Let's start with a bee friendly landscape. Plants with flower spikes are also enjoyed, as the bees can move from flower to flower very quickly – think catnip, and goldenrod. Blue and yellow are favorite bee colors. Bees can't see red! White Dutch clover and other flowering groundcovers provide a grass alternative that can create a bee oasis in the smallest yard. Just like everything else, bees need water to survive. If the water container is too deep, they may drown. Place some small stones or floating some pieces of wood in your bird bath, or purchase a bird bath with a very gently sloping outside edge. Fountains and moving water are much loved by bees, butterflies and other insects – but not mosquitoes, who need still water to lay their eggs in. There are even tiny solar fountains that you can float right in your birdbath for a simple option to create moving water. Bees can't swim, so they have to be able to access water without treading water. 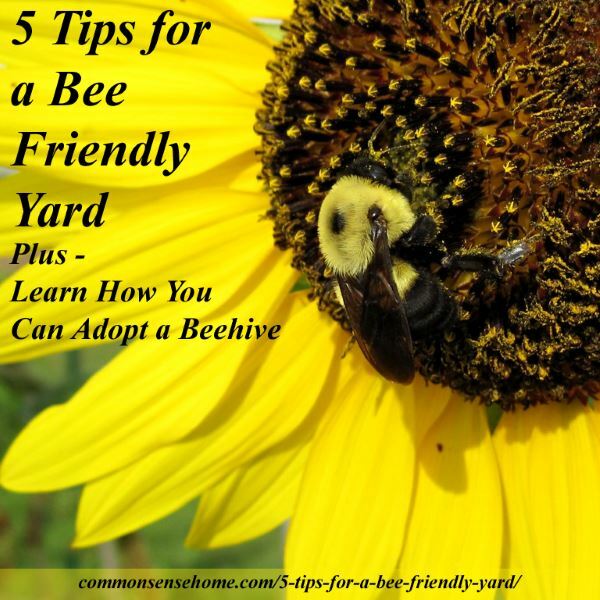 Bee Friendly Yard Tip #4 – No Pesticides! The Center for Food Safety has compiled a list of home and garden products containing neonicotinoids. You can download a copy of the full report “ARE NEONICOTINOIDS KILLING BEES? A Review of Research into the Effects of Neonicotinoid Insecticides on Bees, with Recommendations for Action” here. 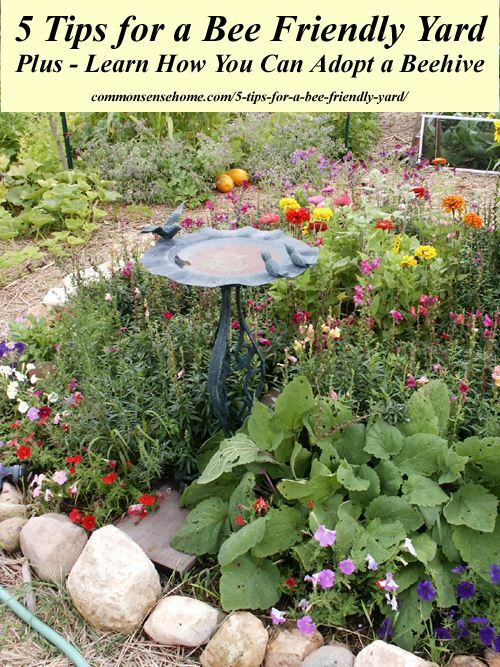 This tip is primarily for the bumblebees and other native bees that don't live in hives. (Of course, sometimes honey bees do form wild hives, but most of us don't necessarily have the space to accommodate a large wild hive.) Bumblebees are ground or box nesters, depending on the species. (Old mouse nests are a favorite.) They need a natural, less disturbed area to nest, which may be able to be more easily worked into yard or garden edges. Many native bees, such as mason bees, are solitary nesters. They prefer nest blocks or hollow plant stems for shelter. Don't be so quick to clear out all garden debris! A bundle of sunflower stalks tucked into a corner can make a great nest site. 70% of our native bee species nest in the ground and must have access to a sunny location with bare soil or very little vegetation. The other 30% of our native bees make their nests in old mouse tunnels, beetle tunnels, holes in trees, pithy plant stems or twigs, and in similar spots. To help native bees, leave an area of bare soil in a sunny location, keep perennials up over winter as bee nesting cavities, and leave some less tidy areas with old logs and dead trees, cut back to a safe height in highly trafficked areas. Cox Honey contacted me to help get the word out about their Adopt a Hive initiative. Delaun Mills Cox started caring for bees all the way back in 1880, and the beekeeping tradition has been passed down through the family for over 100 years. Their bees forage on high mountain clover. Their honey is gently heated for extraction – never pasteurized – preserving the enzymes present in the raw honey. 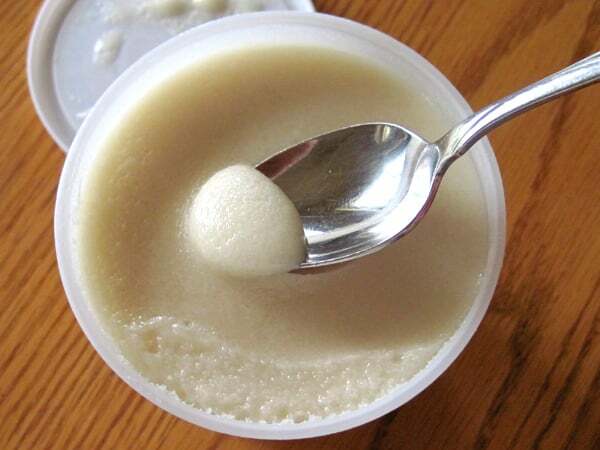 It is also screened rather than filtered, to retain the trace amounts of pollen in the honey. Cox Honey Farms Creamed Honey has a rich, velvety texture that makes it easy to spread and enjoy. By adopting a hive you become a beehive sponsor ensuring that a community of bees are protected and cared for correctly and their research can continue to solve the major environmental issues. Also 10% of every purchase will be donated The American Beekeeping Federation in your name to further preservation efforts for the Honey Bee. ​All Memberships will renew automatically at the end of their membership year unless notification is received. Please review terms and conditions. Memberships received in February, May, August, November will have honey sent 31 days after Membership start date. What are you doing to help the bees? 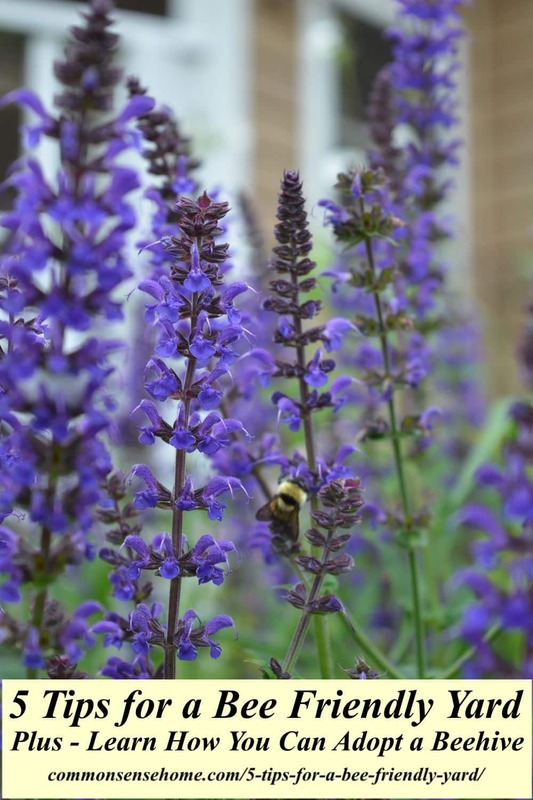 Which bee friendly plants do well in your area? 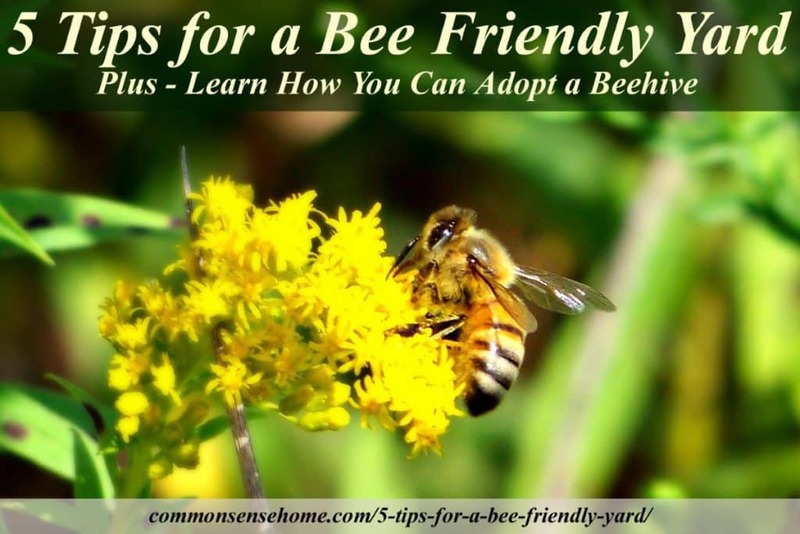 How have you made your yard and garden more bee friendly? Are you a beekeeper? I'd love to read about your experiences. Please Share or Pin this post to help make everywhere a little more bee friendly! Bees (honeybees especially) love oregano flowers – They also like sage & lavender. Herb gardens are useful & really can attract a lot of bees. Oh yes! All those are bee favorites in my garden, too! I love working around the fresh herbs. I stumbled on some bee balm seeds this year and decided to plant some. I got hurt right after and couldn’t make it to the yard for a month. When I went out I was blown away by how beautiful it is and how many bees were there. I love watching them. I will be putting your suggestions into play most definitely. Plant large masses of a single type of a flowering plant, rather than one or two specimen. When the scout bees find a plentiful source of pollen and nectar, they will take the information back to the hive, and the bees will feed on the plants. The smaller specimens will likely be ignored. Also seek out your local small beekeepers. I’m talking about the people who keep fewer than 10 hives and don’t transport them across the country. The ones who aren’t in your local grocery store because they don’t have the volume needed. We don’t use a lot of honey, but I always make sure we have a supply of locally harvested honey on hand…local is best, because it can help with allergies…and Manuka is so expensive…. I find it very soothing to listen to the hum of the bees as I work in the garden. I have a small herb garden and the bees really love the oregano, marjoram and thyme. I put lime on my lawn to adjust the pH, and now the grass grows fast enough to keep the dandelions in check (I no longer poison or pull them); I also have clover in my lawn and the bees flock to it when it blooms. I do not know where they nest or what they eat, but I have a lot of small native bees in my yard. Herbs are wonderful for bees. Thank you for making room for them in your yard.